A campaign is when you pick some search criteria, and then set PW to automatically bid on sites matching those criteria. You can also narrow by the specific keywords people have put on their sites — which gets great results if, for example, you make an ad featuring your vampire characters and splash it over sites tagged “vampires” — but for this I kept it simple. Views and clicks are exactly what they sound like. PW also tracks uniques — that is, if one reader binges the entire Leif & Thorn archive, then whoever has the winning bid on the skyscraper ad will see their stats increase by 926 views, but only 1 unique. CTR is click-through rate. The higher it is, the better, again on both “the ad is good” and “the sites are your target audience.” But don’t get too excited — it’s going to be less than 1%, probably less than 0.1%. There are 3 versions of each ad. One blank, one with “BL” in the corner, and one with “LGBT+” in the corner. I checked in several times over the course of the month, and sometimes one label or the other appeared to be pulling ahead, but over the long run? Absolutely no difference. A logical follow-up would be to see whether the labels help (or hurt) on banners where the image isn’t already telegraphing “hey, this is pretty gay” on its own. And/or to see what effect they have in a campaign that targets sites with LGBT-related tags, where you know it’s a specific point of interest with the audience. Previous post: New interview published on Art of Webcomics! Not for me. Your comics gave me food for thought, and it’s not as if the ding-dongs fly over the computer screen, no, your comic is tastefull and beautifull. LBGT sounds more neutral to me, but overall my most preferred option would be just not to include any further explanations. Those are the bad associations I was thinking of, yep. Thing is, just because someone is a teenager who likes shallow fluffy stuff, that doesn’t mean they wouldn’t also like something more complicated! I know I liked a wide range of things when I was that age. And if you’re a reader who’s hungry for LGBT characters getting to be the protagonists, and got into BL because it was your first exposure to that, not even realizing yet that it’s only one slice of what’s out there… I don’t want to leave those readers on the table, you know? I know the label wasn’t getting more clicks overall, but sadly the analytics here aren’t refined enough to know if there are specific people who avoided one version of the ad but clicked another. Honestly when it reads “M/M” I immediately go, “Not interested”. It automatically sets off the “Plot is secondary” alarm in my brain and makes me keep looking. 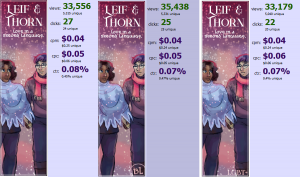 I’ve seen several ads on L&T that have what looks like good art and possibly interesting plot hooks, but then I see that tag and I’ve already moved on. I definitely also associate BL with over top dramatic teenagers, not a deep story with great world building. Not necessarily a straight no, but I’m definitely a lot pickier with it, need a good hook or something else very interesting in the ad to get me to check it out. I’d be interested in the follow up of whether the results were affected with art that was less romantic, such as action or comedy themed. 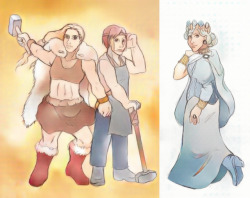 Would it be ironic if the BL tag plus art of women was super effective? I tend to think of “BL” as something written by women for an intended audience of straight women, which makes it feel alienating for me. (I like reading stories about men falling in love because I AM a queer man, so when most of these stories give a strong vibe of “no, this story isn’t FOR you”, it feels pretty uncomfortable.) I also associate it with some fairly problematic tropes, including outright homphobia and queerphobia. I’d still probably give something with that label a chance if it looked interesting, but I’d be more wary. Whereas something labeled “LGBT+” (or, even more so, “queer”) is something that I’m more likely to seek out because it seems like it’s written with a queer audience in mind. I prefer LGBTQ+ as the label. In this comic it fits, since you have characters that fall under every one of those. 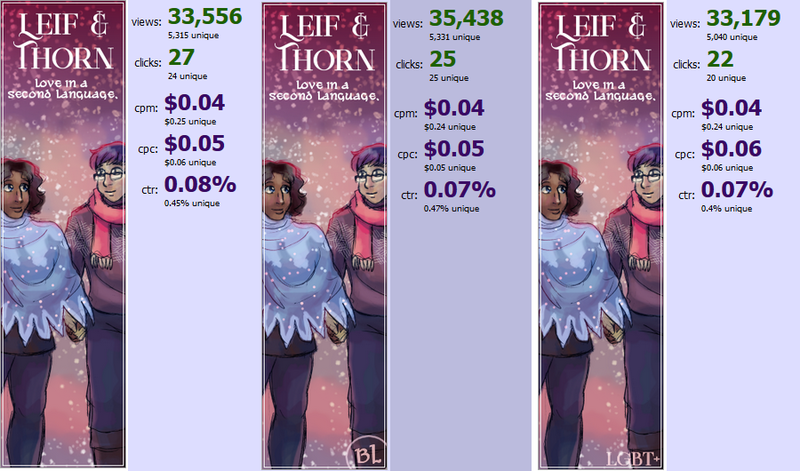 While yes, the story is about Leif and Thorn it’s about more than just that. It’s an inherently queer setting, with so many queer characters and I love that aspect. 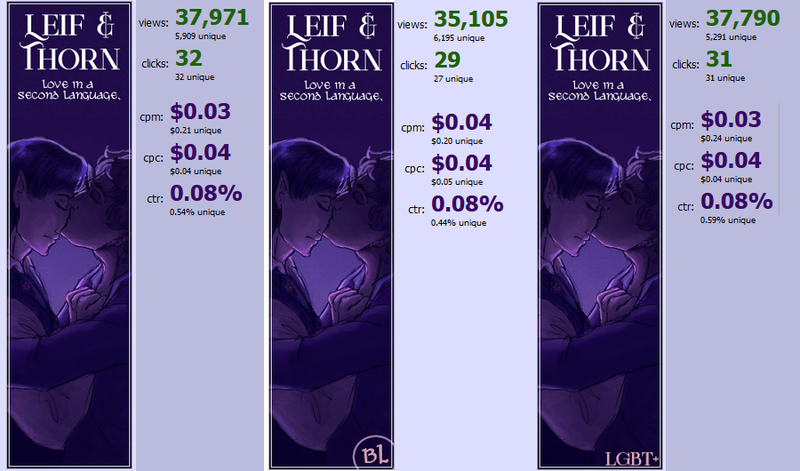 It’s such a rich diverse world, and while there is Leif and Thorn’s romance at the centre there’s also a lot more. 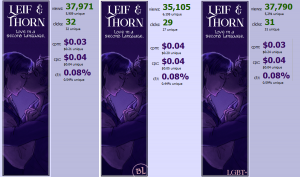 I found the comic specifically because I was looking for lgbtq webcomics in the fantasy genre. I’m not actually that interested in the romance genre, which bl tends to make me think of. That said I’ll probably click on a link with bl on it if just to see what type. Also wondering, of those that click on the adverts, how many stick around and read all of the comic? I know I’ve clicked on adverts to comics and then been nope not for me. I also agree with what Char is saying. BL makes me think of a lot of tropes that really don’t interest me. As a professional advertising data wonk (I’m a taxonomist who makes sure categories like “webcomics” and “vampires” are available for you to select), this is really interesting! CPM is actually Cost Per Mille, i. e. per thousand, not million. Blame the Romans for a horribly confusing acronym.